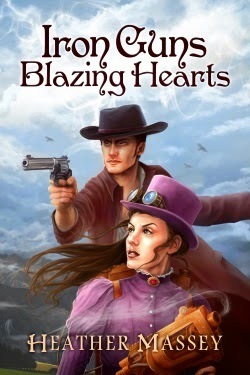 IRON GUNS, BLAZING HEARTS, my Weird West steampunk romance, is now available as a self-published edition. When Lyrical Press merged with Kensington, I opted to have the rights reverted back to me. Second, the ebook includes all-new content, including my short story "Steambot Rampage. "* If you just want access to the short ("sweet" heat level), you can download it for free. Click here for links. Readers will also discover a whole bunch of information about steampunk romance since I included previous posts I've written about the genre (updated slightly to reflect newer titles). All the bonus content adds up to over 10k words! Having the freedom to share information about steampunk romance books by other authors in one of my ebooks is really exciting to me. I had the opportunity to pay-it-forward, so I took full advantage! Third, the new price is a budget-friendly $2.99. IRON GUNS, BLAZING HEARTS is available through Smashwords, Sandal Press, All Romance eBooks, and Amazon. *You may recall my previous post regarding donating proceeds from sales of "Steambot Rampage" to the American Cancer Society. Before making this story available for free, I donated all profit as promised on 9/10/14. If you contributed via a purchase, thanks for your support!